Landowners and land managers throughout Oregon can contribute to conserving fish and wildlife by maintaining, restoring, and improving habitats. These conservation actions benefit Strategy Species and Strategy Habitats, and are important regardless of location. However, focusing investments in prioritized areas, or COAs, can increase the likelihood of long-term success, maximize effectiveness over larger landscapes, improve funding efficiency, and promote cooperative efforts across ownership boundaries. COAs are places where broad fish and wildlife conservation goals would best be met, and they have been designated for all ecoregions within the Conservation Strategy, except the Nearshore ecoregion. COAs were delineated through a spatial modeling analysis and expert biologist review (COA Methodology). Continuing the voluntary approach to Strategy implementation, conservation actions will likely be implemented within COAs by a variety of partners (e.g., landowners, land managers, agencies, watershed councils, local land trusts, Soil and Water Conservation Districts, etc. ), and will encompass all types of land ownership and management approaches. COAs were developed to guide voluntary conservation actions in Oregon. Land use or other activities within these areas will not be subject to any new regulations. The ODFW COA map, dataset, and underlying profile information should only be used in ways consistent with these intentions. The total size of COAs covers 33,349 square miles, which is roughly 34 percent of the state of Oregon. View a high resolution image of the ODFW COAs. Each COA has an associated COA profile with supporting information on Conservation Strategy priorities. This information includes a list of: Strategy Species, Strategy Habitats, special features, recommended conservation actions, local conservation plans, and potential conservation partners. Web links are provided when possible to assist users in locating more detailed information and guidance on the local conservation priorities. COA profiles can be accessed through the Conservation Opportunity Areas page, either by selecting areas within the COA map or by selecting specific COAs in the list or grid view. COA profile information is available for download in an Excel table format: Download the Oregon Conservation Strategy. 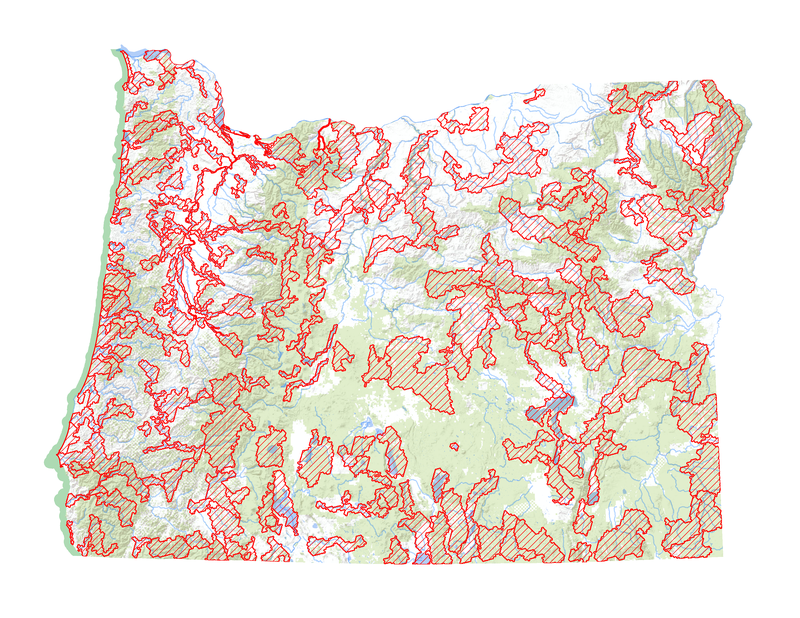 During the Oregon Conservation Strategy revision process, efforts were made to improve how COAs work alongside Oregon’s existing protected areas. For example, federal Wilderness Areas may be restricted from undergoing restoration or enhancement projects, but they provide an important protection of areas that contain high concentrations of Strategy Species and Strategy Habitats. All Wilderness Areas have been removed from ODFW COAs, with an effort instead placed on including areas directly adjacent to Wilderness Areas. The intention was to maximize the area within COAs where conservation actions can take place, while also building upon existing protected areas in an effort to enhance connectivity and contiguous blocks of Strategy Habitats. Sixty-three percent of the land encompassing COAs is owned and managed by government agencies. The majority are federal lands (92 percent), with state lands accounting for 5 percent and the remaining 3 percent split among local government agencies. COA profiles include a Special Features section, which highlights protected areas within each COA and links users to local conservation plans. Another focal area of the COA revision process was to improve how urban, or developed, areas were incorporated into the analysis. The initial COA modeling process, undergone in 2006, incorporated raw landscape development data, such as roads, census population areas, and Urban Growth Boundaries (UGBs) to avoid areas highly impacted by development. An improvement within the revised COA modeling process, completed in 2016, is the availability of species movement models developed by The Nature Conservancy (TNC). These models were generated using updated UGBs as well as transportation, transmission lines, and other development-related datasets, and they predict the impact of developed areas on the ability for a species to move across the landscape. This allowed the COA revision analysis to focus on the impact of development to Strategy Species, rather than simply avoiding populated or developed lands. Nearly half of the revised COAs (93 out of 206) include at least some land within an UGB, totaling over 300 square miles of urban areas included statewide, and providing ample opportunity to undergo Conservation in Urban Areas.